I'm excited to be part of Chalk & Notch's Top Knot Tour today! When I heard the themes, I had to go with the Sister Style. Usually anything I make one child gets stolen by another child because they want the same one, or I hear tons of whining until the same pattern is made for them. So this was perfect! This tour has TONS of talent on board, along with some great giveaways. 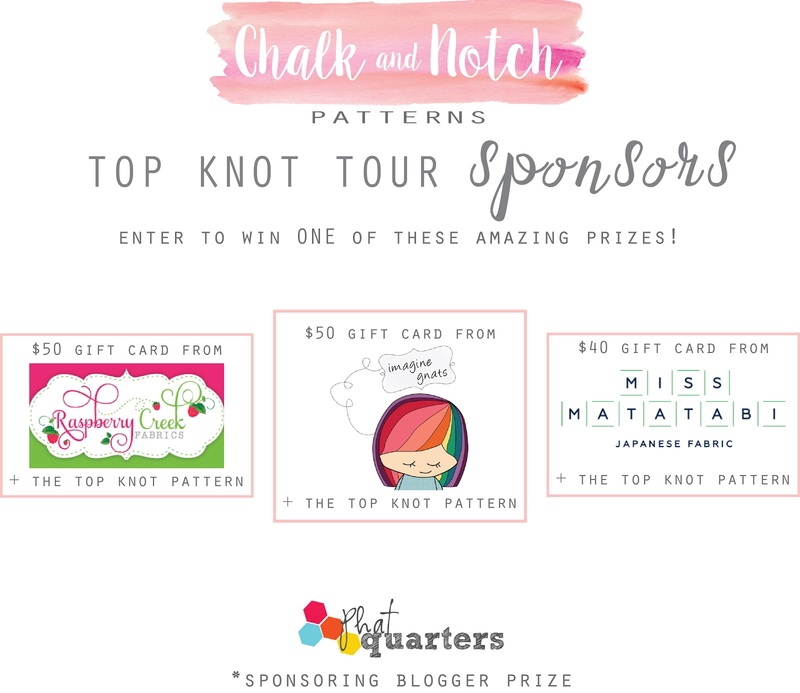 So make sure to check out each blogger and read all the way through mine and leave a comment to enter in your chance to win a copy of the Top Knot Pattern and don't forget to enter the Rafflecopter for your chance to win a prize from one of these awesome sponsors! 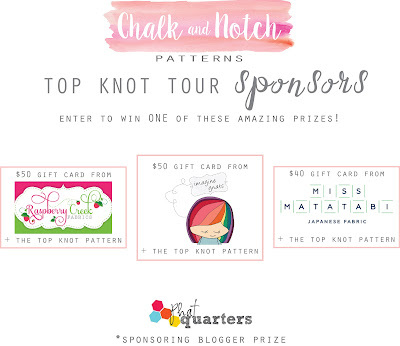 You can also use the code: tkt20 for 20% off Chalk & Notch's store through Friday, July 1st! Zoe and Paisley are a year apart and have always done everything together. I love that my girls are so close in age. I have two sisters too, but we're so far apart in age I didn't get the same experiences that my girls are going to have. The pattern has some absolutely gorgeous features. I'm in love with the "drop shoulder" with pleats and all the cuffs. The fabric is some Rayon stuff I bought from Walmart a couple years ago. I wanted something very light and airy for these and this fabric was perfect. Not to mention, the print is just as quirky as the child wearing it. I got the snaps from Kam Snaps when I bought their starter kit. I really have been putting it to good use. And sorry that you get tons of pics of my girls today. They did an awesome job with this shoot, although we still have quite a number of super silly pics captured too! One word: HEM. I really need to invest in a rolled hem foot. It really reminds me of a 20's dress. Super flowy and fun. Paisley got buttons for hers since these were the last 4 in my stash. Sewing the button holes on this was soooo easy. The buttons totally redeemed the hem. I really want this dress for me. Her fabric is the same quality as Zoe's and also bought at Walmart. I changed her shoulders up a bit and gathered them instead of doing the pleats and I left the cuffs off. I'm not really good at making my girls "matchy-matchy". They have a couple things that match or coordinate, but mostly all their clothing is completely different. Paisley DID get pockets though. Poor girl is usually jipped out of the pockets since she gets all of Zoe's hand-me-downs. This dress has amazing flow. She was having so much fun twirling around. And now onto the fun stuff! 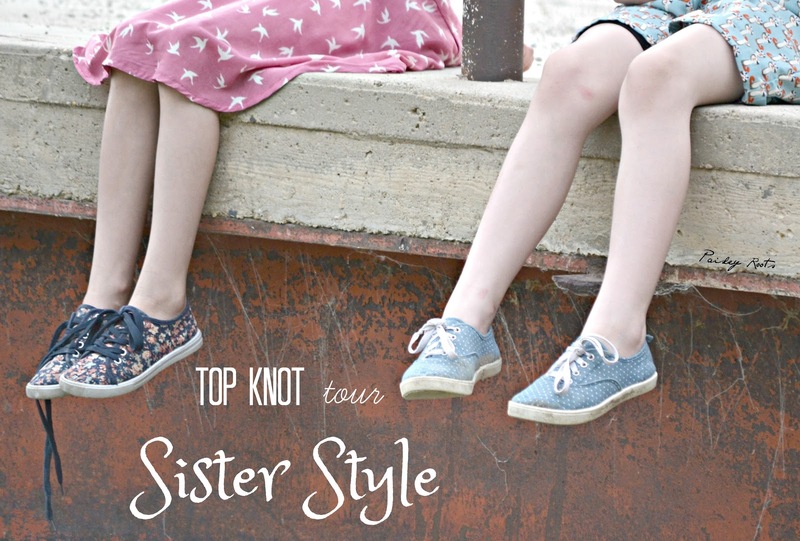 I will be giving one lucky reader a copy of the Top Knot Dress. To enter leave a comment about something you love about having a sister. Or if you don't have one, something you love about your best friend, because really, they're our sisters we get to choose! Then go check out all the other amazing looks on tour and don't forget to enter the Rafflecopter!!! Yeah I want that dress for me too! I just had the thought right before I clicked over to your post that I need to try a gather instead of pleats on my next version. Vibes! Haha. I love both fabrics, the quirky blue one is seriously cute. Your daughters are super lucky to have each other and look like the best of friends! Uhhhh, I love the gathers on the shoulders. Will have to try that for my next one. Both versions are perfection and I can't figure out which one is my favorite! Oh my gosh, these photos are so precious, what adorable girls. You did an amazing job on their outfits too, I love that one chose a dress and the other a romper. How funny that the buttonholes made up for the hem. They are so precious together! Sisters are the best! I love your choice of fabric, such a nice drape! what lovely lovely sister pictures!! LOVE the dress and the gathers, just too darling!! These outfits look so vintage! I love them. And these two are my favorite little troublemakers. Love love love ! The fabrics, the colors, the pictures... It's perfection !